How long do you think ice cream sundaes have been around for? 50 years? 70 years? … How about 119 years? Yep, that’s right. The first documented ice cream sundae was made on April 3rd, 1892 in the United States. There’s still controversy surrounding the birthplace of the ice cream sundae, but I think everyone can agree that it is one of the most delicious American desserts ever invented. I converted a classic sundae (vanilla ice cream, chocolate sauce, whipped cream, sprinkles) into a cupcake (vanilla cake, chocolate ganache filling, whipped cream frosting, sprinkles) and enjoyed them as much as the real frozen kind. Rating: 4.5 out of 5. - In a large bowl, on the medium speed of an electric mixer, cream the butter until smooth. Add the sugar gradually and beat until fluffy, about 3 minutes. Add the eggs, one at a time, beating well after each addition. Add the dry ingredients in three parts, alternating with the milk and vanilla. With each addition, beat until the ingredients are incorporated but do not overbeat. - To make the chocolate ganache, warm the heavy cream and butter with the chocolate, chopped into small pieces, and bring to the boil in a thick-bottomed saucepan, by which time the chocolate should have melted. Remove from the heat and whisk till smooth and thickened. Let cool a little before using. - Using a sharp, small knife cut out a 1-inch center. Set aside the 'cut-out' cake piece. 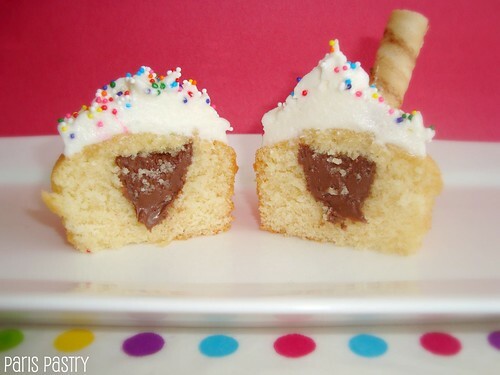 Fill the cupcake with chocolate ganache. Top the filled cupcakes with the left-over cake piece, pressing down to flatten the cupcake. Continue with remaining cupcakes. Ice Cream Sundae Frosting: My own recipe. - Whip the heavy cream until it forms firm peaks, place it in the refrigerator to set while you get on with the rest. - In a medium bowl, mix the shortening, confectioners' sugar, vanilla and milk together until smooth. Fold in the whipped cream with a rubber spatula. Use immediately. 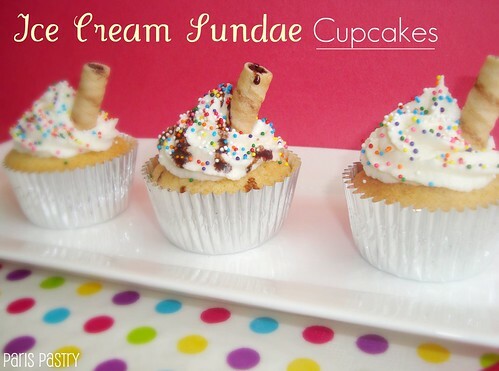 The temperatures are going up, and I'm enjoying it all with ice cream sundae cupcakes! erg leuk!! vooral die verrassing van ganache binnenin ;) mooie foto's ook! Een Nederlandse lezer hier! Vraagje: wat gebruik jij voor vegetable shortening? Margarine? Very cute! Love the wafer cookie :). They look like very delicious and they are very nice to see too! a very precious cake!!! So cute!! I love the way you set them up for the photos! Yum yum yum! 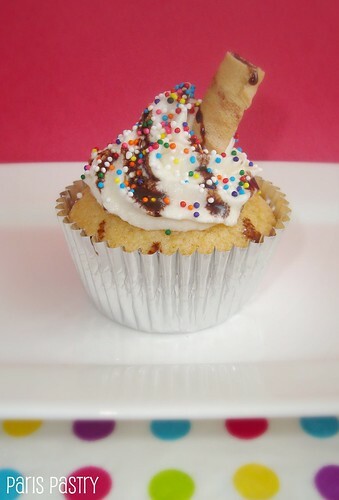 I love your interpretation of an ice cream sundae into a cupcake, and I love the fun way you photographed them too! Oh these look TOO good.